You’re in the process of filing the I-130 immigration petition for your spouse and you’re stuck on one tricky part. Exactly how do you prove that your marriage is real? Here are 10 types of evidence you can submit that will help get your I-130 approved. WARNING: If you’re considering entering into a marriage solely for the purpose of getting an immigration benefit, don’t do it. Marriage fraud has brutal consequences (including criminal consequences), for both the potential immigrant and the U.S. citizen or permanent resident. Download the FREE Immigration E-Book! Once you’re married, you’ll need to submit taxes together. Showing that your finances are intermingled is a great signal that your life is intertwined. If your marriage is less than one year old, you might not have yet filed joint taxes. That’s fine, just keep it in mind for the future. Also, if your marriage is new, remember that you will need to file Form I-751 to remove the conditions on your residency. Proving that you live together is another great signal that your marriage is real. Submit your lease if you’re renting. Submit your mortgage if you bought a home. In either case, it’s better if both names are on the document so keep that in mind if you’re searching for a place to live now. Even if you are living with a relative or a friend and there is no formal agreement, you can still prove you are living together in other ways. For instance, you can submit proof that you each receive important mail at the same address, or a notarized statement from a landlord stating under penalty of perjury that to his knowledge you both live there together. Shared finances are a big sign of commitment. Joint bank accounts are excellent proof of this. Note that it’s not enough to simply have an account in both partners’ names if it’s just sitting there idly. You want to show that both partners are depositing money into the account and using money from the account to show that it’s active. Proof of insurance is another great form of evidence. This could be car insurance, life insurance or health insurance. For example, perhaps one partner is a beneficiary of the other’s life insurance. Or, one partner is on the other partner’s health insurance plan through their employer. Utility bills in both partners’ names prove that you live together and that both partners contribute to household finances. Even if you split the utilities (for example one partner pays gas and the other electric), you can still submit those bills as proof of shared financial responsibility and shared living. It’s helpful to submit any official documents that show you have the same address. These affidavits from family and friends are essentially letters written under oath that testify to the validity of your relationship, shared life, and love for one another. These are especially great for new couples that may not have a lot of evidence otherwise. Your friends and family can talk about how they know you, how they met you, how they see you together at events, and how they think about you as a couple. It’s really important that these letters are unique and from the heart. You don't want everyone saying the same thing; you want the letters to be personal. These letters should come from U.S. citizens and residents, and you should include proof of that person’s citizenship (ie copy of passport) or permanent residency (copy of green card) as well as contact information. Affidavits do not need to be notarized; however, notarizing an affidavit can add credibility which will allow the officer to give it more weight when looking at the entirety of the case. This is the fun part. Pictures, pictures, pictures of your relationship. Photographs should span the entirety of your relationship, from the beginning until now. Stay away from sending the same selfies in different clothes. Try to submit photographs that show where you are and that include other people to prove that you present yourselves as a couple to the world. Another great way to prove that your relationship is public is to submit evidence from social media. This can be photographs (with the date posted and comments from friends), relationship status, or any other kind of communication that’s public. Immigration often does look into applicants’ social media accounts. In this case, I think it's an asset. It shows that you are public with the nature of your relationship and love for one another. Kids! Proof of having children together is the strongest evidence of a real marriage. If you have a child together, definitely submit evidence of this (a birth certificate with both parents’ names listed). If you don’t have a child together but one partner has a child from a previous relationship, this can still be an excellent sign of shared life. For example, if you partner has a strong relationship with the stepchild and you have photographs together, that’s a great signal of a happy, blended family. This is not a checklist and you shouldn’t use it like one. Every relationship is unique and you are going to have different evidence that proves your marriage is real. The bottom line is that you want to prove your relationship is loving, public and committed. Use any evidence that you think does this. For example, if you don’t have a shared bank account but you have done a lot of travelling together, submit evidence of your trips. If you attended events together like weddings or conferences, submit evidence of that. If one partner is learning English to help them acclimate to their new, shared life in the U.S., submit evidence of English classes. Don’t be afraid to think outside the box! If you're thinking of submitting any other type of evidence not mentioned here, please comment below. What Happens After the I-130? Now you know exactly what type of evidence you need to submit to prove that your marriage is bonafide. But what about immigrating? This family-based I-130 petition doesn’t get you an immigrant visa. You also need to know what immigration process you’ll take to become a lawful permanent resident. To help you figure this out, I've written a FREE guide just for you. Note that this ebook is not a substitute for a legal consultation, but it will give you a helpful overview of the process. If you have any questions about your marriage-based visa, I'd be happy to help. I’m Sharon Abaud, a dedicated and passionate immigration attorney, fluent in English and Spanish, located in the Los Angeles area . Call (310) 803-3040 or visit https://abaudlegal.com/appointment/ to schedule an appointment. Ready to start the green card process now? Before you file any paperwork, I highly recommend that you have your case reviewed by a licensed immigration attorney. Immigration is complicated and there may be aspects of your case that could lead to your application being rejected or denied. An immigration attorney can help. In my YouTube video, I discussed the family-based immigration petition Form I-130. As I explained, Form I-130 is not an application for a visa in and of itself, but rather it is a part of the family-based immigration process. If you want to immigrate based on a family, you will need to have the I-130 application approved. The I-130 petition proves that you have a qualifying relationship with an individual who is a U.S. citizen or permanent resident. In some cases, it is possible to submit this application and be able to remain in the United States while it is being processed by the USCIS—a process called “adjustment of status.” Depending on your family relationship, you may be able to submit the I-130 application and I-485 application at the same time. If you qualify for adjustment of status, I strongly advise that you immigrate this way. It’s preferable over the other option, “consular processing,” for a few very important reasons. First and foremost, adjustment of status allows you to remain in the U.S. with your family and provides you with a work permit while your case is being processed. Consular processing requires that you leave the U.S. and complete the process abroad. Adjustment of status can sometimes be less costly and faster than consular processing. Adjustment of status means you can become a permanent resident without having to leave the United States. Leaving the U.S. is always risky. There is always a chance that your application will be denied and you will be stuck abroad, potentially indefinitely. Want to Know if YOU Qualify for Adjustment of Status? The I-485 application is the application to change your immigration status to permanent residence. While the I-130 petition is filed by the U.S. relative, the I-485 application is filed by the person who is actually seeking a green card. If you are filing through a relative other than an immediate relative you will not have a visa immediately available. This means that you cannot file the I-130 at the same time as the I-485. However, you may be able to file the I-485 before your visa is available. See my video on this topic to learn more. You can also find information on your visa priority date by checking the visa bulletin. I strongly advise my clients not to travel when they have a pending immigration application. As I said before, it is always a risk to exit the United States as there is a chance you will not be readmitted upon reentry. If you absolutely must travel, you should get permission from the USCIS before leaving. In order to do so, you should apply for a travel document (Form I-131). Do not travel without permission granted. Another reason not to travel is that you may receive an appointment notice from the USCIS while you’re abroad. In most cases, the USCIS does not give you much time to appear for an appointment (a few weeks, not months) so it may be difficult to appear if you are abroad. Failure to appear for your interview can have devastating results. Worst case: your entire case gets denied and your case is referred to immigration court for removal proceedings. It’s possible to apply for permission to work in the United States when you file your I-485 adjustment of status application. This is a big deal and one of the major advantages of filing for permanent residence within the United States. The application for a work permit is Form I-765. One of the final steps in the green card process is finding a sponsor. In this case, I am talking specifically about a financial sponsor, someone who lives in the U.S. who promises to financially support you in case of difficult times. This is something the U.S. requires of all immigration applicants. The sponsor will have to make a minimum yearly income. The I-130 petitioner in your case will need to fill out Form I-864, even if their income doesn’t qualify them to be a sponsor. If this is the case, you can request another person sponsor you (a “joint sponsor”), who will complete a separate Form I-864. All permanent residence applicants are required to get a medical exam. In October 2018, the guidelines for this requirement changed. Now, all medical exams have a 2-month validity period. This means that you must get your medical exam no more than two months before your interview. If the exam took place more than two months before your interview, it is considered expired and the USCIS will not accept it. You have the option to submit the medical exam with the initial filing OR present at interview. I highly recommend presenting the exam at interview. If you submit the medical exam with your initial application, it’s likely that it will expire before your interview and be invalid. Note: It’s important that you keep the document sealed—don’t open the envelope! Note that immigration filing fees are always subject to change. Please check the USCIS website for the most up to date filing fees. This is the most important step! You need to prove that you are not inadmissable to the United States for any reason. There are many reasons a person could be inadmissable, some they may not even be aware of. If it turns out you do have issues of inadmissibility, you certainly want to know about it before you present your case to immigration to ensure you are well prepared to address such matters. This is why I highly, highly recommend consulting with an immigration attorney before you proceed with your case so that they can screen you and make sure there are no issues of inadmissibility. There are many instances where an attorney can help you with these issues, for example by requesting a waiver, when possible. If you have any questions about your I-485 application I'd be happy to help. I’m a dedicated and passionate immigration attorney, fluent in English and Spanish , located in the Los Angeles area. Call (310) 803-3040 or visit https://abaudlegal.com/appointment/ to schedule an appointment. 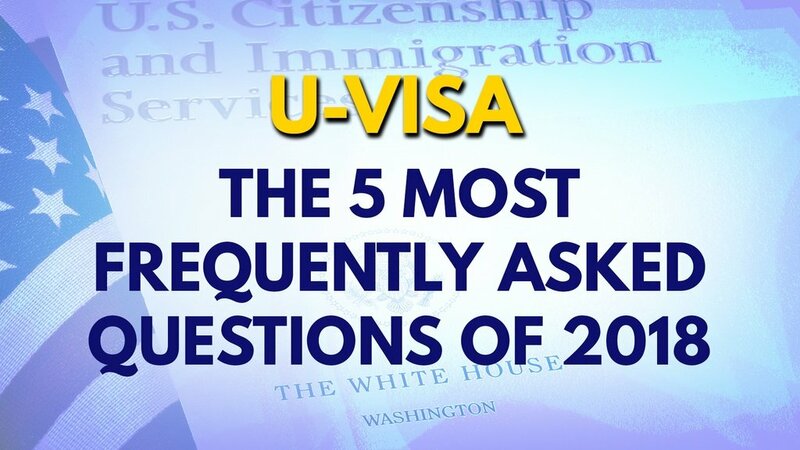 Throughout 2018, I was asked these five questions regarding the U Visa over and over again. Here are the answers. 1) I lived with an abusive partner, but we were never married. Am I eligible to file for a U Visa? Yes! The U Visa eligibility requirements do NOT require the victim to have been married to their abuser. Actually, their relationship doesn’t matter at all. The U visa is intended for victims of crimes, no matter if they had a relationship with the abuser or not. Often times, people confuse the U Visa with a different immigration benefit called VAWA. VAWA, short for the Violence Against Women Act, also helps victims of domestic violence. However, to qualify, you must have been married to the abusive U.S. citizen or lawful permanent resident. Unlike the U Visa, if you were not married, you do not qualify for VAWA. 2) My attorney filed for a work permit along with my U Visa application. Is this work permit valid? Yes! If you were approved for a U Visa, you also qualify for a work permit. In some cases, attorneys decide to file a work permit application at the same time as the U Visa application. Doing so often allows the applicant to work sooner than they would be able to otherwise. In this scenario, the work permit is absolutely valid, even if the applicant has not yet received their U Visa. Before there was high demand for the U Visa, the U Visa processing time was only about six months. However, since then (the last four years), the visa backlog has grown significantly and the processing time is much longer. 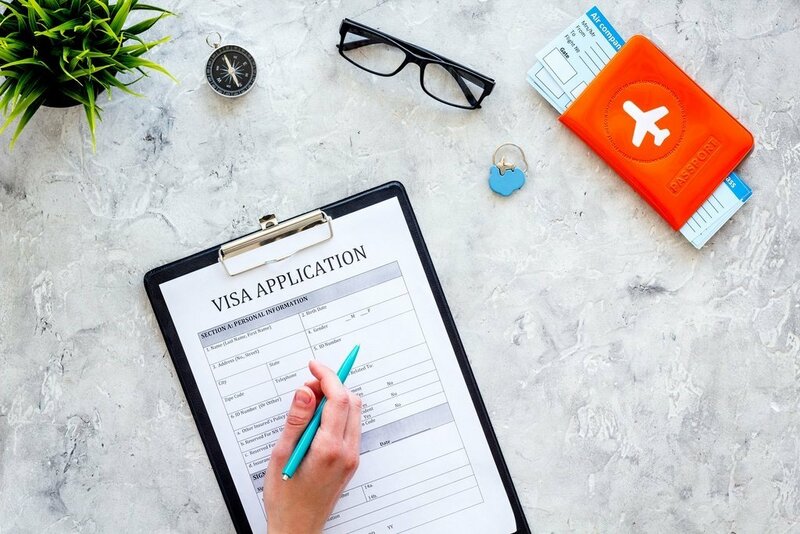 It’s now common for there to be a significant waiting period (several months) between the time when the U Visa is approved and when the applicant actually receives the visa. If you apply for the work permit at the same time as the U Visa, you actually may receive the work permit before receiving the U Visa. Many attorneys file applications in this manner so that their clients have the ability to legally work as soon as possible. 3) I filed my U visa application on [date]. When am I getting my visa? This is by far the most commonly asked question of 2018! I know there's a lot of frustration and confusion regarding processing times and I completely understand. Unfortunately, even if I wanted to, I can’t tell you exactly when your visa will arrive or speed up the immigration process. However, what I can do to help is explain how you can check the approximate processing time for your application and stay up to date on it. This will give you the best idea of when to expect your visa. You might be wondering, “Sharon, why can’t you just tell me when it will come?” First, I get asked this question so often that I simply don’t have the time to calculate the approximate visa processing time for each person that asks. Second, these are approximations, meaning they can change and often do change over time. If I was to check your approximation date today and it was four years away, I could check again next year and find out that the wait time changed to five years. It’s frustrating and awful, but unfortunately that’s the way it is. How do you check your visa processing time and keep track of your case? Click here to watch a video tutorial and subscribe to my channel to receive more helpful information regarding the U Visa. I recommend you check on your case once every month or so. This will give you a more accurate idea of how long you will have to wait. 4) I was the victim of a crime in the United States, but I have since left the country and am living outside the United States. Can I apply for a U visa? Yes! Please do not think that because you left the country you missed your chance to get a U Visa. You can absolutely apply for a U Visa from abroad. However, in order to qualify, the crime must have occured in the U.S. or a U.S. territory. Crimes that occurred abroad do NOT qualify. If the crime occurred in the United States, you cooperated with law enforcement to the best of your abilities, and you meet all the other requirements—then you can certainly file for a U visa. Applying abroad will change the application process slightly. Most significantly, you will have to wait abroad while the application is being processed, which can take several years. What if I have a dependent relative that lives abroad? Can I include them on my U Visa application? Yes! Even if your dependent relative does not live in the U.S., you can include them on your U Visa application. If you are under age 21, you may petition on behalf of your spouse, children, parents and unmarried siblings under age 18. If you are 21 years of age or older, you may petition on behalf of your spouse and children. 5) I was never physically injured. Am I eligible to apply for a U Visa? Yes! You do NOT have to have been physically injured in order to qualify for a U Visa. Being a victim of a serious crime can result in physical injury as well as significant psychological or emotional trauma. The USCIS takes into account all types of trauma when processing U Visa applications. Qualifying crimes that may not have resulted in physical injury to the victim include stalking, criminal threats, and homicide. If you have any questions about the U Visa, I'd be happy to help. I’m a dedicated and passionate immigration attorney, fluent in English and Spanish , located in the Los Angeles area. Call (310) 803-3040 or visit https://abaudlegal.com/appointment/ to schedule an appointment. Can I Travel while I Wait for Adjustment of Status? While it’s possible to travel with a pending adjustment of status application, it is risky. This article goes over the situations in which you can apply for a travel document, how to apply, and the risks involved in travelling with a pending I-485 application. First, let’s define adjustment of status. 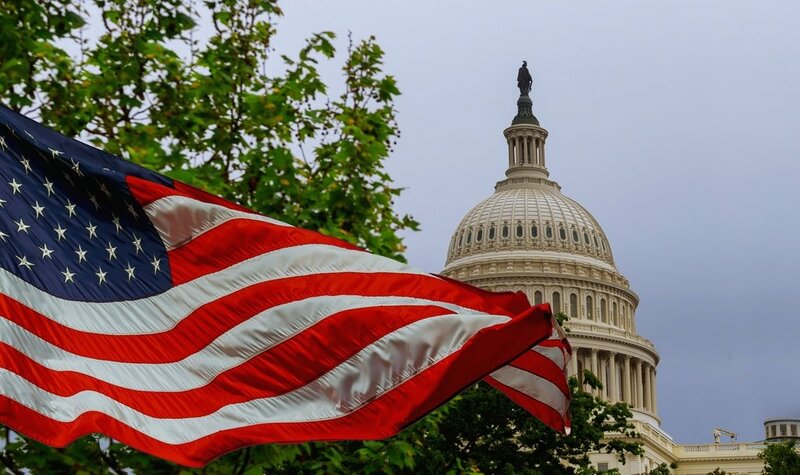 If you are applying for a green card from within the United States with Form I-485, then you are applying through the adjustment of status process. In this process, you are not required to leave the country to attend a visa interview. This article refers to these applicants only. While your I-485 case is pending, you are not yet a resident of the United States. Unless you have a visa that allows re-entry, if you leave the U.S. with a pending application, you risk not being allowed reentry. If you need to travel abroad, you can apply for an Advance Parole Travel Document using the USCIS application I-131. This document gives you permission to leave the country for a specific period of time, for a specific reason. In general, I don’t recommend travelling while you have a pending I-485 application. No matter the reason for your travel and regardless of whether you have a travel document, there’s no way to guarantee that you’ll be allowed to reenter the country. Here’s an example that demonstrates this risk. A colleague of mine filed for an Advance Parole Travel Document on behalf of his client. They were granted the document and the client left to his home country. While he was abroad, the attorney and the client's address in the U.S. received a Request for Evidence (RFE) regarding his I-485 application. He had two months to respond. The RFE required that the client submit a different version of his birth certificate with his I-485 application. The client went to obtain this document and found out that it would take six months to get. However, the USCIS required he submit the evidence within two months. There's the problem. The attorney may be able to save the case. Depending on the situation, they may be able to ask for an extension for the RFE. However, it’s more likely that immigration won’t offer an extension, resulting in a denial of the I-485 application. The client won’t be able to reenter the United States and will be forced to apply for his green card from abroad. In all, this could cause him to spend years outside of the United States while waiting for the new application to process. Because he travelled abroad, he put his case at risk. Was it worth it? I don't know what the situation was that caused him to travel abroad, but it’s important to be aware of the risks when you make this decision. It’s also relevant to note that in our current political climate, people are getting denied entry to the U.S. at the port of entry more frequently. Even with a valid Travel Document and nothing happening to your pending I-485 application while you’re abroad, you could still be denied entry into the country. Being admitted into the United States is ultimately at the discretion of the border patrol officer who is inspecting you. If they determine there is a reason you shouldn’t be admitted, then they have the authority to deny you entry into the country. Every time you travel, you take this risk. If it's not something urgent, I would strongly recommend that you wait until you become a permanent resident before you travel abroad. If it is an emergency, then I recommend you seek the advice of an immigration attorney before making a final decision. If you have any questions about traveling while your I-485 application is pending, I'd be happy to help. I’m a dedicated and passionate immigration attorney, fluent in English and Spanish, located in the Los Angeles area. Call (310) 803-3040 or visit https://abaudlegal.com/appointment/ to schedule an appointment. As of October 2018, the current processing time for a U Visa, a special visa given to victims of crime, is four years. 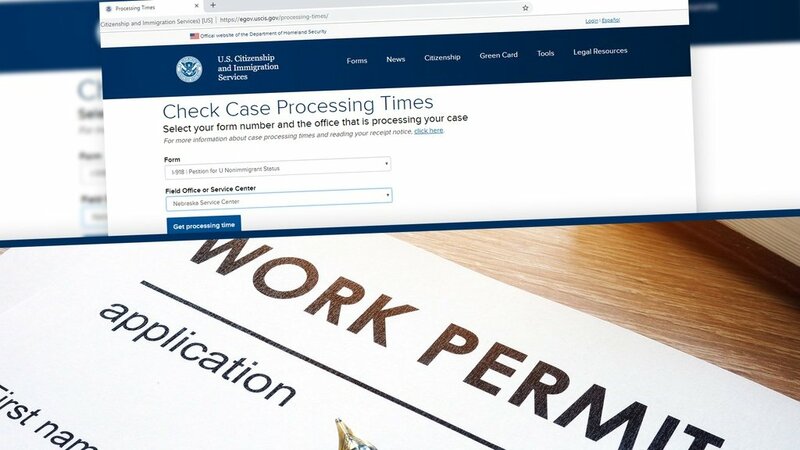 This article goes over the reason for the long backlog and guides you on how and when to can apply for a work permit while you wait. What Is the U Visa? The U Visa is a nonimmigrant (temporary) visa for victims of certain crimes who cooperate with law enforcement in the investigation or prosecution of criminal activity. The U Visa was created in October 2000 with the intention to strengthen the ability of law enforcement agencies to investigate and prosecute cases of domestic violence, sexual assault, trafficking of aliens and other crimes, while also protecting the victims of these crimes. Congress allows for the issue of 10,000 U Visas each year. How Long Is the U Visa Processing Time? In the first years, the U Visa was not well known and so the processing time was short, only a matter of a few months. However, with time, the visa became better known by law enforcement agencies and within the legal profession, which in turn made it more popular among immigrants. More awareness led to more applicants, causing a backlog. As the U Visa has become more popular, the number of visas issued every year has remained at 10,000. As of October 2018, they are only reviewing cases from October 2014. That means it's taking almost four years just to review a case. In the time that your case is under review, you do not qualify for a work permit. Only when a decision has been made on your case, when it is approved, do you qualify. At this time, you will get a letter from the USCIS stating that your case was approved. However, because the USCIS only issues 10,000 visas each year, you will likely still have to wait for your visa. While you wait for your visa to be issued, you will be in an immigration status called “deferred action.” This means that even though you do not technically have a legal immigration status, you are not a priority for deportation. It also means that you qualify for work authorization and can apply for a work permit with USCIS Form I-765. 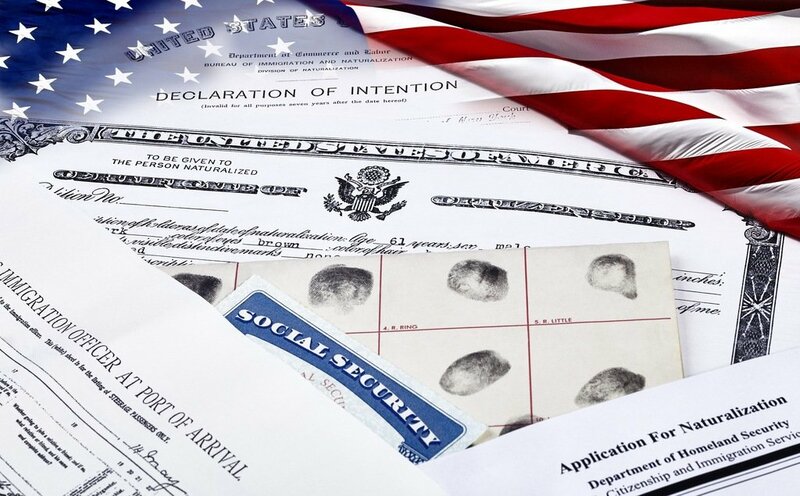 A work permit allows you to get a social security number and begin a fuller life in the United States. It’s the same social security number you get to keep as a resident and later if you decide to become a citizen. It allows you to start forming your social security credit and is the one you will use on your taxes. If you have any questions about U Visa processing and work permits, I'd be happy to help. I’m a dedicated and passionate immigration attorney, fluent in English and Spanish, located in the Los Angeles area. Call (310) 803-3040 or visit https://abaudlegal.com/appointment/ to schedule an appointment. It’s no secret that the green card process is long. 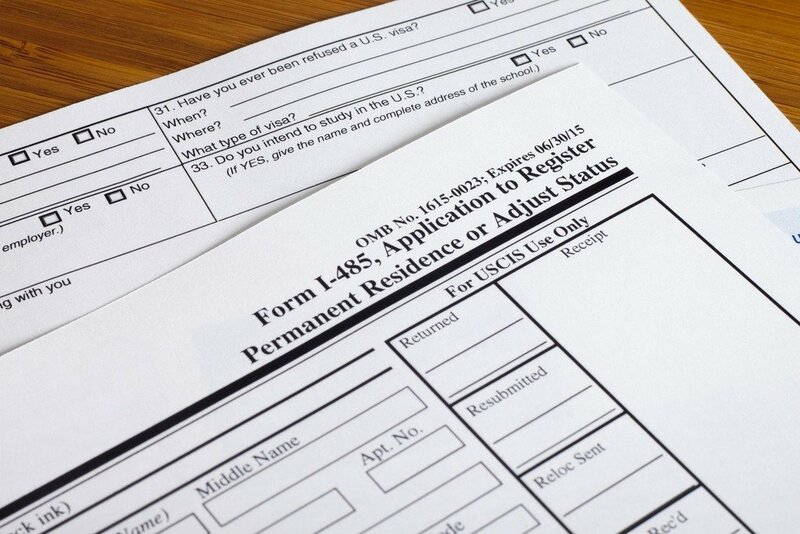 Many applicants spend years waiting to file their adjustment of status (I-485) application. However, there is a faster way to file that many applicants don’t know about. It can give you a work permit and a social security number while you wait for your green card. This process is only for applicants who are eligible to file from within the United States through the “adjustment of status” process (Form I-485). Applicants who are required to leave the U.S. to attend a visa interview at a U.S. embassy or consulate abroad, unfortunately, do not qualify. When you file for residency, by virtue of having a pending I-485 application, you automatically qualify to have a work permit. A work permit gives you a social security number. With both of these documents, you can really start a life in the United States. The trick to this process is all about when to file your I-485. It is for applicants who have already filed the immigration petition (Form I-130) and are waiting in line for their visa to become current. Knowing when your visa is current requires you to check the U.S. Department of State’s Visa Bulletin. Below is the visa bulletin for October 2018. Note that there are two separate charts. Chart-A is the “Final Action Dates for Family-Sponsored Preference Cases” and Chart-B is the “Dates for Filing Family-Sponsored Visa Applications.” Most people only look at Chart-A, but if you can file according to Chart-B’s dates, you will get the benefits of a pending I-485 application sooner. The USCIS determines every month which chart you are allowed to file under, depending on the number of visas that are available for that filing year. While Chart-A indicates the actual date your visa is current, Chart-B often indicates an earlier date on which you are allowed to file. Find out if you can file under Chart-B by checking the USCIS website. Here’s an example. Let's pretend that I'm a U.S. permanent resident married to someone from Mexico, and I petitioned for him today. First, I would look under the visa category “F2A,” because I'm a resident married and I'm petitioning for my spouse. Second, I would look under “Mexico.” Looking at the first chart, the date is August 1, 2016. Going by this chart, we’d have to wait about two years before we could file the I-485 application. But, if you look at the second chart, the date is December 1, 2017. That’s only a 14 month wait until we can file the I-485. That’s a lot sooner and after we file my husband will be able to legally work in the United States and get a social security number. If you have any questions about when to file your adjustment of status application, I'd be happy to help. I’m a dedicated and passionate immigration attorney, fluent in English and Spanish, located in the Los Angeles area. Call (310) 803-3040 or visit https://abaudlegal.com/appointment/ to schedule an appointment. 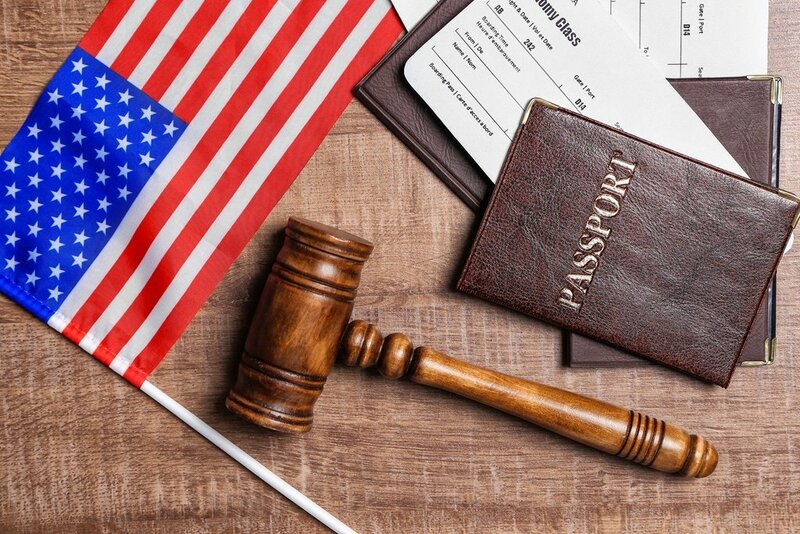 To qualify for a U.S. green card, in most cases, you need to have entered the country lawfully. It’s important to understand what exactly “lawful entry” means. For immigrants that otherwise qualify for a green card but may have illegally worked in the U.S. or failed to maintain lawful status, being able to prove lawful entry is important. Many people enter the country on a visa and overstay. This still qualifies as lawful entry and can help you qualify for a green card. If you have a relative that is a U.S. citizen or permanent resident, or is serving in the U.S. military, you may qualify for a waiver that allows you to immigrate to the United States. Entering the country without documents and without receiving a visa or proof of your entry can sometimes qualify as lawful entry. Here’s an example. You entered the country without a visa or other type of immigration document, maybe as a passenger in someone's car or walking through. In this case, the officer might have simply waved you in. You presented yourself for inspection and the officer admitted you into the country. Even though a formal inspection didn’t occur, under the law, this counts as lawful entry. The hard part in these cases is proving it. Without a I-94 Arrival/Departure Record, a stamp in your passport, or a visa, there isn’t any documented proof of your entry into the country. You will need to present secondary evidence in the form of declarations. This can be tricky and I would recommend you seek the advice of an attorney if this is your situation. It’s also possible to qualify for lawful entry if you entered the country with fake documents, depending on the type of document you used and when you entered the country. Here’s an example. You hire a notario who gives you a fake residency card and enter the country with it. The officer looks at the card, inspects it, and you are let into the country. This is an immigration violation and does have a punishment. But because you were inspected and admitted, it can still qualify as lawful entry and later allow you to lawfully immigrate to the United States. However, consequences vary depending on what type of document you used and when you entered the country. If you in any way pretended to be a U.S. citizen—whether with a fake U.S. birth certificate, fake U.S. passport, or simply in an oral statement—then you committed a serious crime under immigration law. If this occurred after 1997, then there is no waiver and you may not qualify to immigrate to the United States. However, if it occurred before 1997, then you can request a waiver. In this case, you will need to file the waiver to forgive the use of false immigration documents. This waiver can be filed at the same time as the immigration petition or later. In the current political climate, however, I would recommend filing everything together and having an immigration attorney help with your case. If you have any questions about your entry into the United States, I'd be happy to help. I’m a dedicated and passionate immigration attorney, fluent in English and Spanish, located in the Los Angeles area. Call (310) 803-3040 or visit https://abaudlegal.com/appointment/ to schedule an appointment. Family-based green card applications require that you submit proof of the relationship. 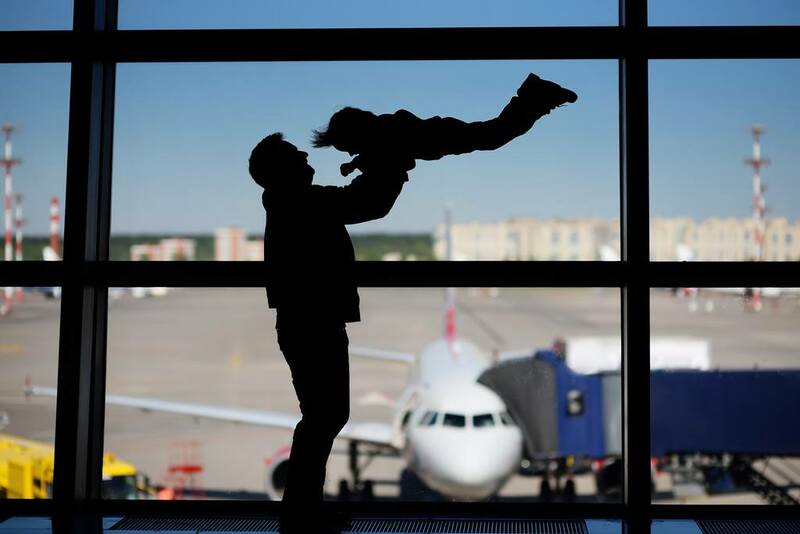 This article gives an overview of how to prove a father-child relationship for USCIS Form I-130, whether the father is petitioning for the child or the child is petitioning for the father. Evidence will vary depending on whether or not the petitioning father was married to the mother before the child’s 18th birthday. The primary document immigration wants to see is a marriage certificate between the child's mother and the petitioning father. Ideally, the marriage took place before the child’s 18th birthday. If a marriage took place after the child’s 18th birthday or not at all, you will need to submit additional documentation. You want to provide as much proof as possible that you publicly treated the child as your own or participated in the child’s life, specifically through financial or emotional support. Proof will vary depending on your situation. I'll give you an example of a father I helped file a petition for his daughter. In this case, the father was never married to the mother. He had left his home country and became a United States citizen, but his daughter was still living abroad. They hadn't seen each other for years. They didn't have any pictures together or other physical proof of that sort to send to immigration. In this case, we sent copies of years worth of letters they had sent to one another. In addition, we submitted evidence of money wires sent from the father to his daughter abroad. If you have any questions about proving a father-child relationship for Form I-130, I'd be happy to help. I’m a dedicated and passionate immigration attorney, fluent in English and Spanish, located in the Los Angeles area. Call (310) 803-3040 or visit https://abaudlegal.com/appointment/ to schedule an appointment. Can I Travel to the U.S. while Waiting for a Green Card? Family-based green card applications can take years to be processed. While your I-130 application is pending, is it possible to travel to the United States? The straight answer is yes, but it’s important to understand what’s expected of you when you take these trips..
Every time you enter the United States on a tourist visa, the B-1/B-2 visa, you are promising the United States that you intend to go back to your home country to live and that you have no intention of living in the United States. But, a pending I-130 petition contradicts this. A pending green card application shows that you do have the intention, at least eventually, to live permanently in the United States. It may cause the immigration officer to ask you questions about your visit and your intent to return to your home country. In some cases, people are even turned away. Here are some tips to prepare for this and avoid getting denied entry. Come prepared. Bring evidence, documents, to the border that prove your intent to stay in your home country. If you're in college, bring proof of enrollment. If you own a home, bring the mortgage. If you have a good, stable job, bring pay stubs and a letter from your employer. Show proof that you have purchased a return ticket. You want to show that you have a steady reason to return to your home country. The more proof, the better. If the documents are in a foreign language, bring translations. Many people think that by having an approved tourist visa they will avoid this problem. But, every time you go to a U.S. port of entry, you are inspected. The border patrol officer has the ultimate power to allow you entry into the United States or deny you. Every time you arrive, immigration's checking you out again, and if since your last arrival you now have a pending I-130, they may ask you questions at the border and they can turn you away. If you have any questions about travelling with a pending I-130 application, I'd be happy to help. I’m a dedicated and passionate immigration attorney, fluent in English and Spanish, located in the greater Los Angeles area. Call (310) 803-3040 or visit https://abaudlegal.com/appointment/ to schedule an appointment. 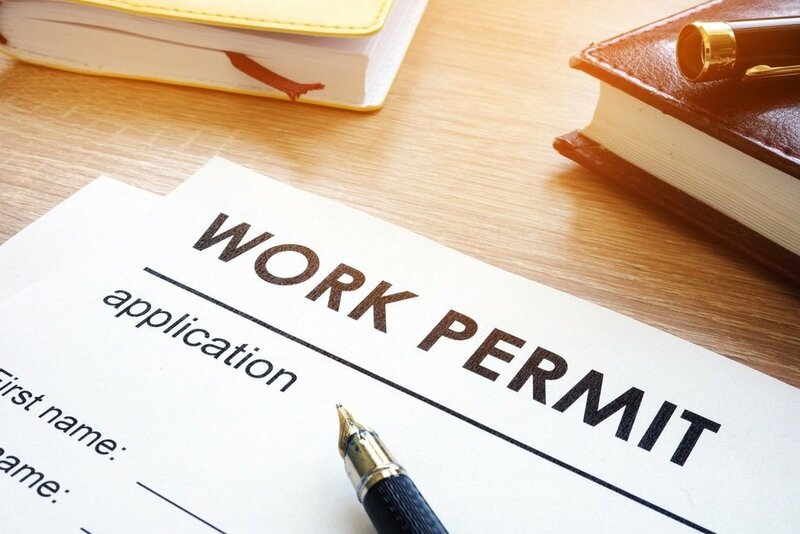 Can I Get a Work Permit While I Wait for a Green Card? Want to work while your green card application is pending? Good news! Many permanent residence applicants qualify for a work permit while waiting for their green card. If you are applying for a green card from within the United States, you likely qualify for a work permit while your permanent residency application is pending. This process, called “adjustment of status,” allows you stay in the U.S. throughout the green card application process and work. You are not required to leave the country to attend a visa interview. Below are three ways paths to get a green card through adjustment of status. Applicants who are required to leave the U.S. to attend a visa interview at a U.S. embassy or consulate abroad, unfortunately, do not qualify for a work permit. How do you qualify to apply for a green card from within the United States? There are three basic ways. These paths are for people who otherwise qualify for a green card but may have entered the country illegally, illegally worked in the U.S., or have failed to maintain lawful status. The LIFE Act or 245(i) is a special policy that allows people to apply for a green card even if they entered the U.S. illegally, illegally worked in the U.S., or have failed to maintain lawful status. To qualify, you must have been the beneficiary of an immigrant visa petition (Form I-130, Petition for Alien Relative or I-140, Immigrant Petition for Alien Worker) filed on or before April 30, 2001. You might have a 245(i) as a derivative applicant if an immediate relative such as a parent or former spouse was approved for an immigrant petition. If you think you may have a 245(i), it’s a good idea to consult with an immigration attorney. Because that is a big golden ticket. Another way to immigrate in the US is through what's called “lawful entry.” If your last entry to the United States was lawful, you may qualify for a green card through adjustment of status. Lawful entry simply means that you were lawfully inspected and admitted into the United States at a U.S. port of entry. It’s important to note that in some cases, your entry may be considered a “lawful inspection and admission” even if you entered with no documents or fake documents and were let in regardless. You may need a waiver to forgive any possible issues of fraud, but the fact that you presented yourself at the border for inspection and the officer admitted you may be enough to qualify you for adjustment of status. The tricky part to this process is finding sufficient evidence of such an entry and, in some cases, filing for additional waivers. If this applies to you, it’s a good idea to seek the advice of an immigration attorney. You may qualify for a U.S. green card if you have a relative in the U.S. military—even if you are currently living in the U.S. without legal status. This process is called “Parole in Place” this is a path to permanent residency for spouses, widows, parents and children of active or honorably discharged U.S. military. You can apply for a work permit at the same time you apply for your green card. Simply file both forms at the same time: Form I-765, Application for Employment Authorization and I-485, Application to Register Permanent Residence or Adjust Status. If you’ve already filed your I-485, you can still apply for a work permit by filing the I-765 separately. It usually takes about 90 days to receive your work permit. If you have any questions about getting a work permit while waiting for a green card, I'd be happy to help. I’m a dedicated and passionate immigration attorney, fluent in English and Spanish, located in the Los Angeles area. Call (310) 803-3040 or visit https://abaudlegal.com/appointment/ to schedule an appointment.